Vertical Inc. specializes in English translations of Japanese books. They have a strong focus on manga but also do cookbooks and craft books, and are starting to do more of them. This is a translation of a book that came out in 2010 by Keiko Komatsubara. As a papercrafter who loves origami, kirigami, upcycling and Japanese crafts, I'm thrilled with all these wonderful English translations. They are done very well, with the original photos and illustrations. This book focuses on practical projects, that are whimsical and charming. Boxes made from paper, notebook covers, portfolios and some wonderful gift bag projects. There are 25 projects total, and they are all simple, clean looking projects that would make wonderful gifts. The paper measurements are mostly international sizes rather than American paper sizing. However, the types of projects translate well and are doable with US sized envelopes and papers. The book starts with the gallery of projects with descriptions and page numbers given for instructions. After that you find a materials list with photos. The materials used are mostly easy to find at your local office supply store and craft store. A few specialty items like decorative twist ties might take a bit more searching. I love a lot of the projects. There are some lovely boxes that would make wonderful gifts by themselves or used as a unique, functional wrapping for another gift. The books, journals and portfolios are all handy to have as well. My favorite projects are the paper pencil case shown in orange on the cover- it's easy to make, and easy to personalize, the house shaped gift bag also on the cover and the pocket tissue box which is one of the last projects. 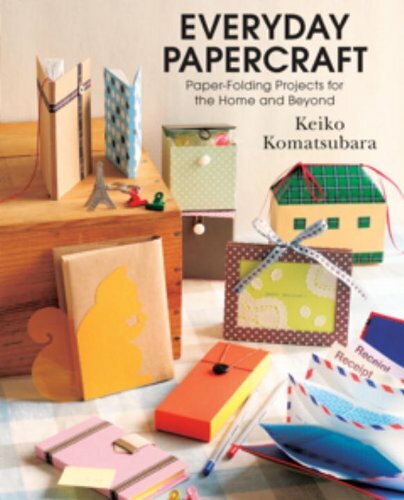 If you enjoy the charm and clean look of Japanese crafts as much as I do, you'll enjoy this book. Like Vertical Inc. on Facebook to get news on their new releases. Amazon.com affiliate links don't affect your cost, and help support this site.